The Lenovo Z5 Pro specifications have been leaked ahead of the device’s launch. The leak comes via 2 different benchmarking websites, AnTutu and Geekbench. First off, AnTuTu, has published the Lenovo Z5 Pro benchmark result on its blog, and it is not a flagship device, as it was originally believed. It is another mid-range phone. The report reveals that the Lenovo Z5 Pro’s model number is L78031. The phone is powered by a Qualcomm Snapdragon 710 processor, with an Adreno 616 GPU and 6GB of RAM. The device has 128GB of storage, and runs on Lenovo’s ZUI 10 operating system based on Android 8.1 Oreo. We already know, thanks to an official photo of the device, that the Lenovo Z5 Pro has a slider mechanism for a full screen design, and the dual front cameras. The leaks don’t tell us the size of the display, but mention that is a Full HD+ screen, with a resolution of 2340 x 1080 pixels. A previous leak suggested that the phone sports a 6.5-inch display. The Lenovo Z5 Pro AnTuTu benchmark score is 161,428 points, which is quite good for a mid-range device. 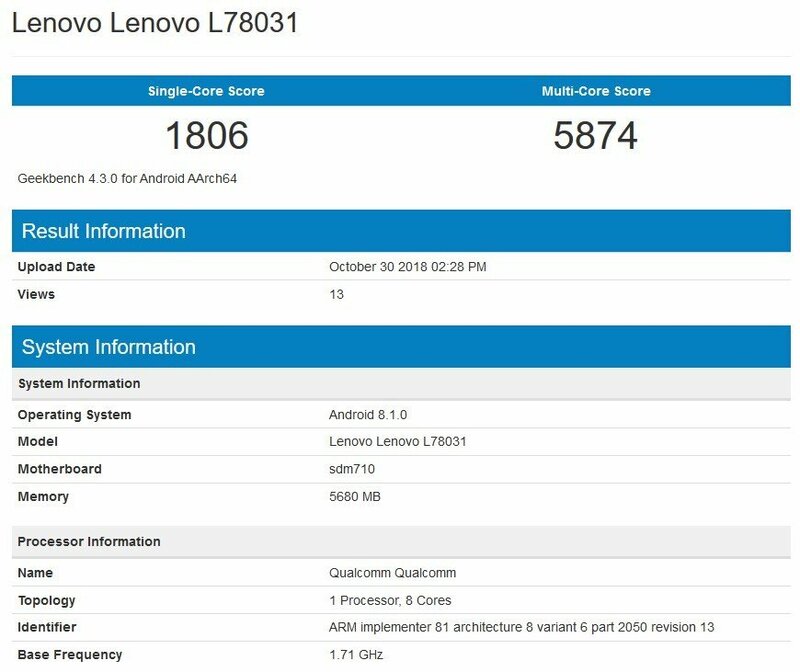 The Lenovo Z5 Pro specifications from the Geekbench leak reveals a benchmark score of 1806 points in single-core tests, while the multi-core score was 5874. The Geekbench listing confirms the device’s model number, processor which is clocked at 1.71GHz, and the RAM.